Family Fun on Clifton Hill - Over 120 Games to Choose From! Fun for all ages lives at Adventure City Games Zone! With a blend of classic arcade games, ticket games, simulator rides and family fun rides, this 17,000 sq. ft. arcade has something for everyone. Redemption games award tickets for playing that can then be traded in for a variety of amazing prizes! So get ready to get your game face on! See, hear, and feel the action at Iwerks 4D Motion Theatre. This special theatre features 3D movie technology, water jets, and air blasters for a truly interactive experience. 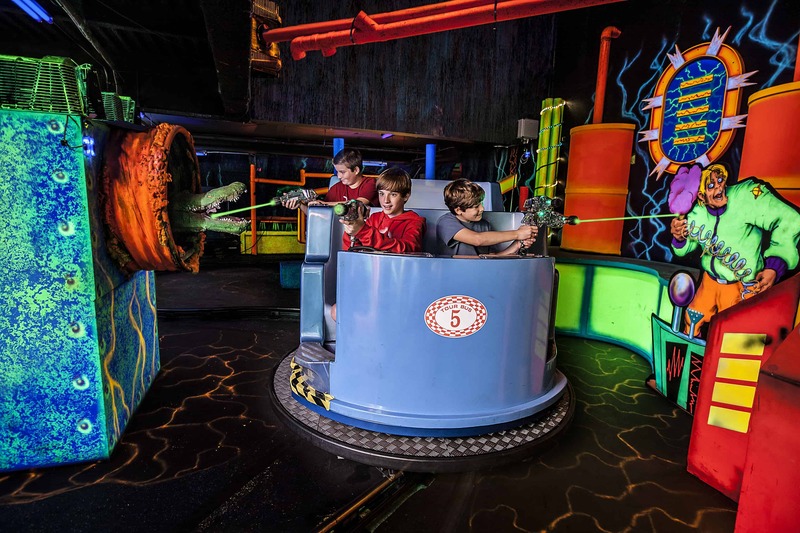 Our current line-up includes: SpongeBob SquarePants 4-D The Great Jelly Rescue & Happy Family The Ride! Strap yourself in and get ready to dodge your opponents as you weave and swerve around every corner in Traffic Jam Bumper Cars! Put your driving skills to the test in gridlock traffic and see if you have what it takes to own the road! All riders must be 54” or taller to ride in the bumper cars. Venture into the depths of the jungle for a Wild Safari themed round of mini-golf! This fun family activity is great in any weather and is the perfect spot to stretch your legs and practice your putting skills. But be warned, one wrong shot may wake the “King of the Jungle”! Everyone loves to shoot some hoops , or beat your high score on Galgaca or Pacman. We have plenty of fun classic games for the old school gamer in the group. If you like to be competitive with your family and friends, enjoy many of our multi player games we have. Team up and shoot the ghost on our ghost buster game or attacked the dinosaurs before they attach you in our Jurassic park game. There is something for everyone! Have the fun of playing and the thrill of winning some pretty awesome prizes. We have over 85 redemption games for you to choose from. Try to win the mega jackpots on our Monster Drop Extreme or Big Bass wheel and walk out a big winner. Ever wanted to race cars in the desert or help an alpha team to take out a bunch of bad guys? Here is your chance with the many simulator games we have here at Adventure City.